Determined to face the Fallen and the world on his own terms, Dante hopes to piece together his shattered past and claim his future, with FBI agent Heather Wallace at his side. But in Heather’s human family awaits an unexpected enemy. One who could rip Heather from Dante’s heart and fill the holes with bullets. One who could force Dante to choose his darkest destiny—as the Great Destroyer. . . . Excerpt from Goodreads. Just when I thought I had a story line figured out Adrian throws us another curve ball. I knew that since there are more books to come in this series that everything wasn’t going to be all happy hearts and teddy bears but, OMG I never saw what was coming in this book! What I love about these books and characters is the bond between Heather and Dante it’s not one sided where she’s all googly eyed and needs him he very much needs her too they balance each other completely. The other characters as well hold a significant place in my heart I especially love Von and Silver their comments always make me smile. There’s so many bad guys in these books sometimes it’s hard to keep track of who’s truly bad; some of these people have flipped sides so many times you get whiplash. Adrian has written another hit! I cannot wait for book five in the Maker’s Song series because this one left us with a total cliffhanger. So if you’re a fan of Adrian’s books or looking for a great new series to read I suggest picking up the Maker’s Song series and book 4 Etched in Bone comes out in stores tomorrow 2/22/11. Happy reading! Note: This review was possible because the amazing Abigail at All Things Urban Fantasy gave me the book to do a guest review on her blog. She will be posting my review soon here's her site http://allthingsurbanfantasy.blogspot.com/ so be sure to check out my review there also. I'll have to check out this series. It sounds very exciting! Great review. I know for sure there will be a book 5 and I think there will be a number 6 too I haven't heard about any after that but I can ask Nate the head if her street team. I hope to have this series going for a long time. I love the characters and their complex world. My publisher had bought books 5 and 6, and hopefully (with good sales), more after that. Okay, I haven't read this series yet - never heard of them before, so to be honest, I'm going to skim over the review! BUT I do have to let you guys know that I'm totally flippin' out over the books that you guys are currently reading! I mean, talk about amazing! 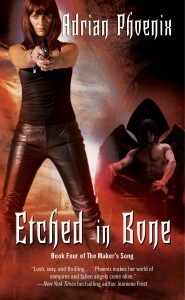 This is one of my favorite series, and Etched In Bone is a great addition to the series. This is such an intelligently written series, that I can't wait to read more.